In recent years, Canada has become one of the world capitals of athletes who show great promise in individual glamour sports. Barrels of ink have been spilled about our just-about-to-arrive tennis stars and might-one-day-win-the-big-one race-car drivers. That wait – along with one of the longest droughts in our national sporting history – is now over. Brooke Henderson is here to show a country unused to the idea that our perpetual contenders can occasionally become champions. Brooke Henderson lifts the champions trophy following the final round of the CP Womens Open on Sunday. 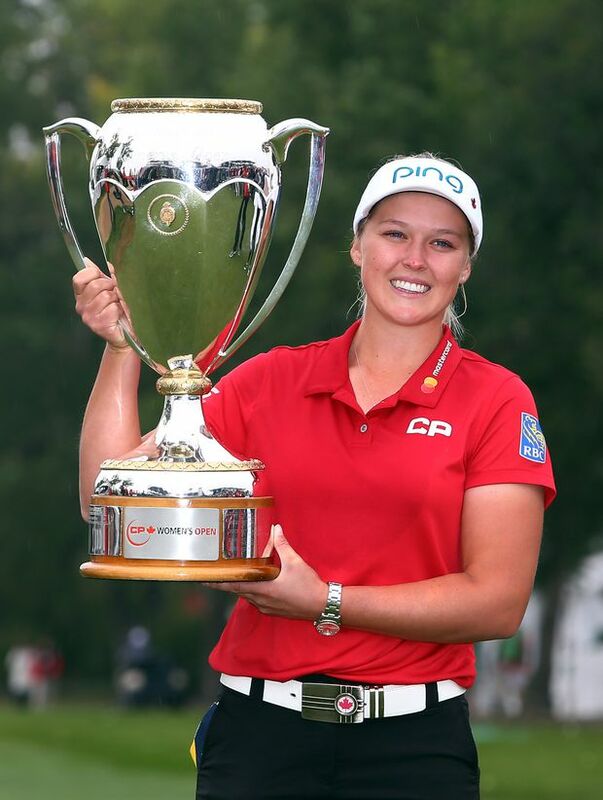 On Sunday, Ms. Henderson, 20, won the CP Women’s Open golf tournament in Regina in suitably regal fashion. She didn’t pull away from her competitors so much as peel off, winning by four shots and posting the day’s low round among the leaders. The final nine holes were a triumphal march. The last home winner of the de facto Canadian championship was Quebec’s Jocelyne Bourassa. She managed it in the tournament’s inaugural year – 1973. On the men’s side, you have to reach back much further – to 1954 and Pat Fletcher. That sort of lag makes the Toronto Maple Leafs’ decades of futility look like a temporary dip. If history was on Ms. Henderson’s mind, it didn’t show. What should have been a nervy afternoon – starting with a one-shot lead – got boring (in a good way) fast. “To get this for my family, and just for the whole of Canada, I’m really happy,” Ms. Henderson said afterward. The significance of the moment hit her then and she began to tear up. It was reassurance that Ms. Henderson is not, in fact, the Terminator she resembles on a golf course once she has taken the lead. She only plays that way. A national curse was one of many things working against Ms. Henderson at the Wascana Country Club. Her two grandfathers died recently within the space of a few weeks, leading to what Ms. Henderson called “a crazy, weird and tough summer.” The course played in the best British tradition – unpredictable winds, steady rain and an unseasonable cold. Bizarrely, the conditions seemed to suit Ms. Henderson and her bottled-up style of play. She is renowned for her technical unconventionality – squeezing up on all her clubs like Ty Cobb protecting the plate, or jerking her body round for shots with a motion so violent and compact it would put most regular humans in traction. As with many great athletes, she was obsessive in childhood – hitting thousands of balls in every sort of weather near her home in Smiths Falls, Ont., freaking out when she lost to much older players. She was a phenomenon from the beginning, winning her first professional tournament while still a teenager. She already has a major – the 2016 Women’s PGA Championship. That made her a star in the golfing world, but Sunday felt like her great breakthrough back home. Ms. Henderson hasn’t just wowed the Canadian sports world. On some level, she’s delivered it. Now we can do away with the dreary self-flagellation before next year’s Canadian Open. That hole in our sports psyche has been patched up. That is, one supposes, how stars are born. Not just by winning, but by making something that previously seemed impossible – say, the four-minute mile – seem easy. Many viewers were presumably new to the Brooke Henderson phenomenon. The first thing that will have hit them is that the main source of her competitive charisma is a complete lack of such while competing. Some people have a laser-like focus. Ms. Henderson’s on-course mien is so intense, it’s more of a Large Hadron Collider. It’s hard to think of any golf pro who looks like they’re having less fun out there. Between her habit of following the flight path of every shot like she’s taken a bet on where it lands, to her further habit of staring a hole in the ground as she walks up the fairway, Ms. Henderson lives so deeply in the moment that she is functionally underground. On the walk up the 18th fairway on Sunday – victory assured, the crowd hooting her name – she still did not allow herself the freedom of a grin. She managed that at the end, once the gallery had begun singing an impromptu O Canada. The waterworks only kicked up once she was asked a question about her recent personal tragedies. Her game face is as resilient as her game. Ms. Henderson arrived a while ago, but Sunday was a different sort of marker. She is now the most notable Canadian athlete who does not wear skates to work. Her seven LPGA titles puts her one behind the great Sandra Post as top the Canadian golfer in history. Just past drinking age, she is already pulling away from Masters champion Mike Weir as Canada’s greatest golfer of modern times. “Unexpected young Canadian sports star” is a crowded marketplace at the moment, and delightfully so. But Ms. Henderson is the first of that cohort to prove herself special in the only way that counts at this level. Her compatriots are good at what they do. Brooke Henderson wins at it.